The Rotary Buffer. Nostalgic? Perhaps. Obsolete? Apparently Not! As of late, there have been substantial advances in the world of paint polishing. Discussions pertaining to compounds, polishes and pads (and the methods used to polish automotive paint) riddle the various detailing forums on the Web. It is an exciting time in our little world, and many of us that partake in the online dialogue really take the debates to heart. In our sphere, there are essentially two types of machines that are used to polish paint: the rotary polisher, and the orbital polisher. The rotary polisher creates a simple yet effective rotating motion, and for decades it was the way to compound and polish automotive paint. Note: There is also a drum-style or barrel polisher which uses a rotating motion, but the pads are barrel shaped as opposed to disc shaped (imagine a stack of foam buffing pads, turn the stack on its side, and mount the stack to a machine that then rotates it like a tire). As things inevitably evolved, so too did the tools used to polish paint. Enter the orbital polisher. 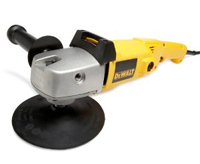 There are a few variations of the orbital available, which are: a standard orbital polisher (which almost nobody uses to polish paint at the moment), the random orbital polisher (which is currently the most popular orbital machine), and the forced rotation orbital polisher (which has become quite popular, particularly in the last few years). An orbital machine that creates two independent directional motions and sums them is referred to as a dual action machine, or simply as a DA polisher. Purists argue that unless these motions are mechanically driven, the machine is not a “true” dual action machine. I completely disagree with this viewpoint, but this is perhaps a good topic for another day. Where am I going with all of this? Nowhere really, except to say that there are so many interesting discussions pertaining to the benefits and drawbacks to each machine. Some guys absolutely adore the rotary, perhaps because it is such a difficult machine to truly master. Once you’ve put the time in to learning to properly use one, it is quite difficult to abandon its allure. The fact is, as of today, the highest paid and most respected paint polishers in the world still use a rotary polisher on a regular basis. On the other hand, popularity of the random orbital has gained incredible momentum. These machines are comparatively easy to use, and thanks to advances in buffing liquid technology, they are every bit as capable as a rotary, for most tasks. As polishing enthusiasts learn to trust in the capabilities of the random orbital, they will certainly squeeze the maximum potential from these machines, just as the rotary polishing masters have done with their trusty steeds.